There is a popular saying that "prevention is better than cure". Before an ailment or situation complicates to something negative, it is advisable to prevent its occurrence as a whole. The same situation goes for insulin resistance; an ailment that involves the inability of the body to metabolize sugars. As with any health issue, the first step in solving the problem is; understanding what it actually is. Well, usually food is absorbed into the bloodstream in the form of sugar, and then this increase in the blood sugar signals the pancreas to release a hormone called insulin. Insulin clings onto the cells and then removes sugar from the bloodstream so that it can be used for energy. In the case of insulin resistance, the body’s cells do not respond to the insulin as effectively as it should, which means that the sugar is not used for energy, which means that the body then stores it in the cells as fat. It is not yet known exactly how and why this occurs, but studies have clearly shown that the higher the blood pressure, the worse the insulin resistance. It is typical that people with insulin resistance have high levels of bad cholesterol (LDL) and low levels of good cholesterol (HDL). Having problems like atherosclerosis (the hardening of the arteries) and other heart problems can be a bright, flashing red light for insulin resistance and should be of big concern. Insulin resistance and obesity go hand-in-hand. This can usually be seen by large amounts of excess body fat, especially around the belly. 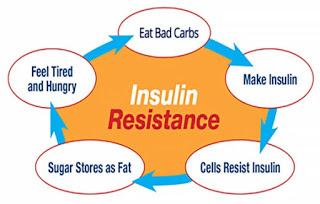 Obesity and insulin resistance works in a vicious cycle where obesity can lead to insulin resistance, and vice versa. Protein in the urine is a sign that kidney damage has occurred, although this is usually not the first sign of insulin resistance. A waist size of 100cm or more in men and 88cm or more in women. Triglycerides levels higher than 2.2mmol/L. A HDL (good cholesterol) level of less than 1.3mmol/L for men and 1.5mmol/L for women. Fasting blood glucose levels of 5.5mmol/L or higher. The key is to get to- and then maintain a healthy weight through the right diet and exercise. These lifestyle changes can also reduce the risk for diabetes and heart disease. There are some blood sugar supplement that can help to reduce the incidence of diabetes in people at very high risk. But lifestyle changes have been shown to have the greatest benefit for decreasing the risk for diabetes. Exercise – Work out for at least 30 minutes a day, for at least five days a week. Diet – A healthy, balanced and caloric restricted diet is recommended.